Chrysler Alpine - Everything you've ever wanted, in one beautiful car. Economy: up to 38.5mpg overall touring. Style: modern aerodynamic design. Comfort for five adults, with carpets, cloth upholstery, superb heating and ventilation, sound-proofing and excellent front wheel drive road holding. The versatility of an opening rear door, and a folding rear seat to give you 49cu. ft. of carrying space. The reliability of a proven engine and suspension. Lively performance: the Alpine S gives top speeds of up to 102mph. Many built-in safety features, including dual-line servo-assisted braking and much more. And Alpine is the only car in its class with electronic ignition, for instant starting even in cold and wet, and consistent ignition performance to cut down maintenance costs. All this - plus 'The Protector' - 12 months' unlimited mileage warranty with free replacement of certain major parts should they wear out during the warranty period. Test drive the Alpine today. Are you a Chrysler enthusiast? Restoring an Alpine? Want a copy of this advert for your garage wall? Have a look in my shop for related items! The Mk1 VW Golf - For all AA Patrolmen who haven't seen it yet. We're not seriously suggesting our cars never break down. But we do have something of a name for reliability. A reputation that continues to thrive with the Volkswagen Golf. It's built to our usual, unusually high standards. Those we've been practising on our Beetle for more than 30 years. We spend 16 hours putting each car together. Inspecting it every nut and bolt of the way. And what happends when it does eventually roll off the production line? We inspect it all over again. Each and every car undergoes a rigorous 239 point quality check. That way, if something falls off in anyone's hand, it's our hand. So you see, even on the new Volkswagens we can still tell our reliability story. A fact that might even tempt any AA man reading into buying one. After all, when you fix cars for a living, the last thing you want to do in your spare time is fix cars. 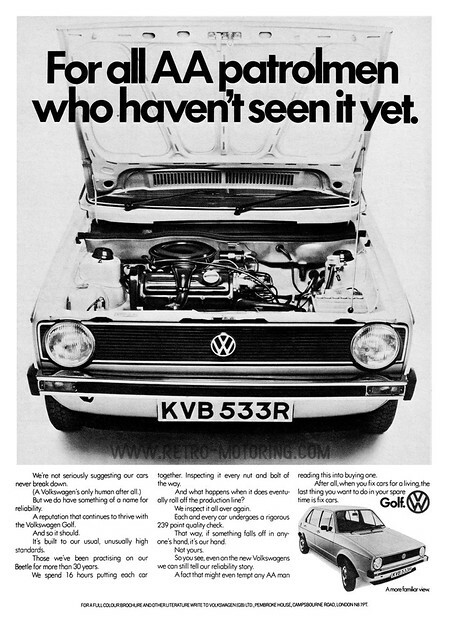 Have a look in my shop for a high quality reprint of this advert along with other VW automobilia. Before the birth of the Impreza legend in the 1990s Subaru was primarily known for making semi-obscure cars and pickups. The quirky flat-four engines and four wheel drive throughout the range didn't really attract much attention in the UK when everyone seemingly wanted Cortinas and Cavaliers. 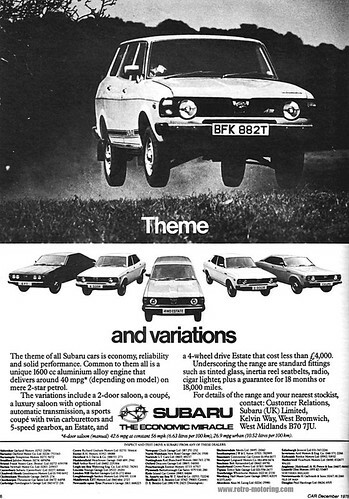 They were popular with farmers though, the advantages of all wheel drive all too clear across muddy fields and when towing, in fact the only Subarus I can remember seeing at all in the 1980s were in rural areas such as North Wales. The pickup variant was perhaps the most stylish truck on the market in that sector at the time. The rear pillar swooping into the truck bed was clearly influenced by the American Chevrolet El Camino and Ford Ranchero. It was quite different to the rival offerings which showed little imagination at all, brutally hacking their body shapes vertically just behind the front seats and nailing on flat set of side panels to surround the bed. I have to admit that I'd nearly forgotten all about the MV until I saw one recently. They were called the "Brat" in America and marketed as a lifestyle recreational vehicle, it's a shame that they weren't sold in the same way here as we may have rather more of them around today if they had been.